The concepts of life and death are utilized strategically to contribute to the military effort of IS. Examples from video releases and religious songs shed light on how these concepts are portrayed in IS propaganda. 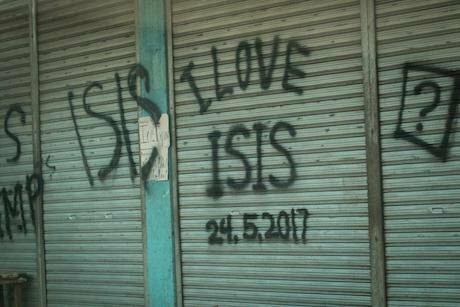 Abandoned house vandalized with "I LOVE ISIS" is seen in a door of a house inside of a NO GO ZONE in Marawi, southern Philippines on June 9, 2017. NurPhoto/SIPA USA/PA Images. All rights reserved. One major source of the resilience and rapid territorial expansion of so called Islamic State (IS) lies in the group’s ability to invest in death through managing it strategically to achieve significant military gains. It is astonishing to realise that over the course of 2016, IS launched nearly a 1000 suicide attacks in Syria and Iraq. Although resorting to suicide operations is not new to radical Islamist organisations, IS’ deployment of such a staggering number of suicide attackers is an unprecedented phenomenon in the history of modern Islamist activism. How is this possible? What is new in IS’ rhetoric and mobilisation strategies? To answer this key question, it is vital to contextualise the practices of IS, historically and doctrinally, focusing on certain themes such as martyrdom, jihad, life, death, and afterlife. To that end, we studied the ideological and doctrinal underpinnings of the group by reference to the relevant Qur'anic verses and Prophetic sayings in addition to the way they were interpreted and appropriated. We reviewed around 60 videos released by the group since October 2016 as well as many anāshīd (religious songs) produced and used in these releases. This is meant to make it easier to understand IS propaganda and the apparent appeal of the group’s media messages. The main argument revolves around the idea that, with IS, the entire Islamic rhetoric on life and death has been appropriated to advance the political project of the Islamic Caliphate. IS propaganda suggests a worldly solution to the intrinsic ills of this life, i.e. living under the Islamic Caliphate. Ideals and dogmatic convictions are central to the processes of radicalisation. Radical Islamist groups, such as IS and al-Qaeda, capitalise on certain psychosocial vulnerabilities to mobilise people and to effect their strategic plans. These groups realise that there are two prerequisites for becoming actively receptive to the jihadi messages. The first condition is the lack of any sense of belonging to this world which results from a state of cultural, social or economic alienation. The second condition is a psychological one and is characterised by a state of disorientation concerning the meaning and purpose of life. These psychosocial gaps are essential preconditions for an individual to become engrossed in a process of radicalisation, leading eventually to him/her justifying or even committing horrendous acts of violence. Nevertheless, despair, anger, alienation, and poverty remain insufficient to trigger acts of mass violence. They necessarily need ideological channelling before transforming into an all-out destructive force. Unlike low-risk activism, such as protesting or social media campaigning, suicide attacks require full commitment to a cause or a dogmatic conviction. In the case of radical Islamism, Olivier Roy states that “young radicals are sincere believers: they truly believe that they will go to heaven, and their frame of reference is deeply Islamic.” As such, ideas matter, and the discourse of Salafi-Jihadism is not insignificant; rather, it is at the heart of the process of radicalisation. In this equation of radicalisation, the role of radical preachers is to offer a simple blueprint for life within which approaching death is presented as an empowering and emancipatory act. Media messages that are produced and disseminated by radical Islamists have for a long time exploited the Islamically, ‘widely-accepted’ framing of life, death, and salvation. The vast majority of Islamic sources tends to portray the worldly life as a temporary, insignificant phase wherein believers are faced with pains and hardships. Also, ‘true Muslims’ are encouraged to abandon the pleasures of this life and focus, instead, on fulfilling their religious duties which will lead them to an eternal life in Paradise. Thus, pain and sadness are normalised and presented as inescapable if one is a devoted Muslim whose aim is God’s satisfaction and the everlasting pleasures of the Hereafter. To emphasise the latter idea, preachers refer to the Hadith: ‘This world is the believer’s prison and the infidel’s Jannah (Heaven)’. A quick tour through the Islamic literature reveals that the negative portrayal of life is the mainstream one. Muslim preachers, radicals and pacifists alike, share the notion of perceiving this worldly life with suspicion. For example, the gloomy depiction of life is summarised in a Friday sermon delivered in 2010 by Sheikh Mohammed Rateb al-Nabulsi, a well-known Damascene preacher usually considered 'moderate'. Nabulsi provides theological justifications for regarding the worldly life as temporary and the abode of deception, amusement, and aberrance in contrast to the Hereafter which is deemed real and everlasting. Similarly, the radical preacher Mohammed Shamsuddin was featured in a Channel 4 documentary saying: ‘The real life is the life of the akhira (the hereafter), not this life. This is not the real life, my dear brothers. This is a passing time for us so this is a type of jihad for you’. It is noteworthy that amongst those who attended Shamsuddin’s sermon is one of the three perpetrators of the recent London Bridge terrorist attack. Following the same line of religious thought, the pleasures of Paradise are granted only to those who perform their religious duties and follow God’s commands in this life. Also, those who seek the Hereafter are encouraged not to get attached to wealth or family, following the example of the Prophet who said: ‘Be in this world as though you were a stranger or a wayfarer’. Such traditions have been manipulated by modern Islamist groups and appropriated to serve their political ambitions. Members of these groups are indoctrinated to abandon the pleasures of this life and encouraged to sacrifice their life to deserve the afterlife generous rewards. In this respect, radical Islamists instrumentalise the concepts of jihad and martyrdom to bestow authenticity on their violent and ‘irrational’ methods of activism. In the Qur'an and Hadith, the act of intentionally seeking death is praised on condition that it was performed ‘for the sake of God’. While suicide is clearly condemned in the Qur'an as evident in ‘do not kill yourselves. Indeed, Allah is to you ever Merciful’ (4:29), seeking death in the way of God is repeatedly presented as the best of deeds. However, the ambiguity of the meaning of ‘the cause of Allah’ makes it prone to manipulation. During prophet Muhammad’s lifetime, those who fought under his command were fighting in the cause of God. Subsequently, with Muslim infighting becoming recurrent, ‘the cause of Allah’ transformed into a rubric under which various Muslim factions operated. This continued in modern times and the ‘cause of Allah’ has been appropriated even by the secular pan-Arabist regimes for their propaganda. Soldiers and citizens who died defending the lands of Arab countries were portrayed as the ones who are referred to in the widely known verse ‘And never think of those who have been killed in the cause of Allah as dead. Rather, they are alive with their Lord, receiving provision’ (3:169). With the rise of al-Qaeda and IS, the cry ‘in the way of Allah’ has accompanied the execution of atrocious acts of violence as reportedly in the London Bridge attack where the three perpetrators were shouting ‘this is for Allah’. IS provides a partially different rhetoric concerning the meaning of life. With IS, the narrative on life and death tends to suggest a worldly solution to the intrinsic ills of this life, i.e. living under the Islamic Caliphate. Establishing and expanding the Islamic Caliphate where shariʿa is upheld has become the only purpose of life, and death has been managed in a way that serves the purpose of sustaining the Caliphate. The group’s propaganda messages encourage young Muslims to give up on the worldly pleasures and intentionally seek death to deter oppressors and enable other Muslims live with dignity and safety under the Islamic Caliphate. The group frames suicide attacks as a formidable strategic asset that will pave a way for establishing the Islamic State and instating the rule of shariʿa. Using IS rationale, the individual interest does not matter, what matters is the welfare of the Muslim community and future generations. This entails that the irrational decision to carry out a suicide attack is framed as rational and strategic from the perspective of the wider community of believers under the Islamic Caliphate; and that is what should matter. As such, the entire Islamic rhetoric on life and death has been appropriated by IS to advance the project of the Islamic Caliphate. IS propaganda messages provide an important insight into the terror group inner thinking with regard to life and death. IS media releases play a central role in today’s jihad scene. The availability of modern communication technologies and platforms has broken the monopoly of mainstream media outlets and allowed the group to independently broadcast its messages. Social media has provided Jihadi groups with the flexibility and speed that no classical media has ever provided. IS media messages target both residents of areas controlled by IS and those outside in the Middle East and beyond including potential recruits. Therefore, IS media messages contain both tactical and contingent topics as well as religious and doctrinal ones. This makes IS media an interesting window into which one can identify what the group’s leadership is focusing on and the main tenets of belief which they celebrate and propagate. To understand the way life and death are portrayed by IS, this article has reviewed around 60 videos and religious songs released by the group since October 2016. There were a number of recurrent themes identified in these media messages concerning death and the way IS rationalise and exploit it. As death is always juxtaposed with life, the way IS media portrays life will be discussed first. Contrary to the popular wisdom, life for IS is not denounced in its entirety. Rather it is viewed as a phase worth living if spent under Islamic shariʿa. The portrayal of life in IS media is not gloomy or miserable but empowering and lively. This is often demonstrated in showing vibrant cities and happy residents enjoying their times in shopping or socialising. The main point is that IS can establish a stable and prosperous state able to defend Muslims and address their day to day needs. Media releases tackling this issue focus on the efficient bureaucracy created by IS, provision of people’s needs, implementation of Islamic rules, etc. While these points are still featuring in media releases today, they were particularly highlighted during the expansion phase of IS. One of the examples of this trend is a video release titled The Bricks of Construction. In that video, the stability of the city of al-Raqqa and effective management of the state through agile bureaucratic system were featured. It showed how the state was able to provide job opportunities through which people can live in dignity. The video showed a person comparing between the conditions of work when the regime was in charge and when IS has taken over. He explained that no comparison could stand. Working under IS administration, the video release purported, made him feel comfortable and respected. Living in dignity is indeed a significant concept upon which IS media emphasizes. According to this media, only IS can provide dignified life for Muslims in the world. True Muslims living under IS are portrayed as living in dignity and glory and that they even feel superior to non-believers or ‘apostates.’ The usage of the work ‘vetted’ [mafhous] to describe those fighting with the coalition highlights the degrading view towards those aligning themselves along nationalistic movements and positive law – vis-a-via shariʿa law. In other words, Muslims fighting against IS are viewed as stooges, hired by regional and international actors and have no say over their own destinies; in sharp contrast with IS Mujahideen who are noble men, following only the example of the prophet. Ironically, the significance of living with dignity in the IS’ Islamic Caliphate becomes the gateway into one’s propensity for giving up life when leading life under the Caliphate is threatened or deemed impossible. One of the media releases that shows this relationship between life and death is a video titled "You will be Superiors if You Are True Believers." The video shows how true Muslims [i.e. supporters of IS] look down at non-believers and ‘apostates.’ The video argues that superiority in life is connected to the piety and in a believer’s readiness to give up his life for the sake of the Islamic Caliphate. The release featured a lot of suicide attackers praising them and highlighting their human stories. One of them was a dentist. The video talked about his successful career then his decision to join the fight as he found that fighting the enemy in the time of war and dying for the cause of Islam is more important than treating patients. Portraying suicide attackers as successful professionals is a recurrent theme in IS media. Portraying suicide attackers as successful professionals is a recurrent theme in IS media. The pretext behind this is that those who give up their lives are not doing so because they were desperate or miserable; rather because dying is more valuable if it is for the sake of God and the survival of the Islamic Caliphate. In other words; if living under the Islamic Caliphate is threatened, the reason for life is no longer available and death will be welcome to ensure the continuity of the Islamic Caliphate. In a release titled "The Knights of the Departments", the video highlights the contribution of the professionals working in the bureaucratic structure of IS. The video shows that, after the coalition offensive on al-Mosul, these professionals have become suicide attackers to defend what they see as the land of Islam. In a sense, getting involved in suicide attacks - while glorified and cherished - is naturalised and normalised. It is portrayed as a nature reaction of true believers working in different sectors to external infidel attack to topple the Islamic Caliphate. The readiness of a Jihadi to give his life for the sake of the ‘installation of the law of God’ is one of the most recurrent themes in IS media. The saying of Khalid bin al-Walid that ‘Muslims love death as much as their enemies love life’ is often cited. It is indeed remarkable how IS media releases celebrate death and highlight the ease through which jihadis go to their death. "The Seekers of Life" is one of the releases that tackles these points very elaborately. The release celebrates and praises suicide attackers who see death [martyrdom] as the true life. The release narrated several stories that all share the passion for death for the sake of Islam [i.e. IS’ Islamic Caliphate]. One of the stories were about two jihadis each so eager to go first in a suicide mission that they had to take a draw to settle the dispute. In another story, the suicide attacker was encouraged by his father. The father explained to the camera his happiness that his son will be ‘wed’ to martyrdom, drawing analogy between the happiness of a son’s marriage and his death for the sake of Islam. Other media releases also focus on the eagerness of jihadis including the elderly and disabled to die. In a release called "The Procession of Light", the stories of a number of jihadis were featured with focus on their love for death. One story talks about a jihadi whose legs were amputated and who had to travel from one city to another just to register as a suicide attacker. The release also shows an elderly man weeping as he wanted to participate in a suicidal operation. Similar stories of such eagerness for joining suicide missions are widespread in IS media. . Overall, the main drive cited for rushing for death is seeking eternal life as the Islamic Caliphate has become threatened by ‘the enemies of Islam.’ This drive may be propped up by grievances but this is by no means prevalent. The IS approach towards life and death is aggressive and proactive. Every time I look around, torn between feeling courageous and scared, injustice provokes me to go to death – I may live long but eventually I am destined to die – So why don’t I die in dignity while holding my sword!? Death then is welcome, glorified and praised if done in defense of the Islamic Caliphate. This gives death its non-escapist nature. In other words, what is truly praised and glorified is the purpose of death - its strategic role - not death itself. Unintentional death caused by violence - such as the death of children in the coalition attacks and others - is seen as a source of grievance often used to rationalise extreme violence against the enemy. While this is common in all Jihadi literature, IS exploits this in an industrial scale. IS media highlights this very elaborately. One of the most notorious release that showcases this argument is "The Retribution of Traitors." The video portrays life in areas controlled by IS to be stable and prosperous before the coalition attacks. The video focuses on the death toll caused by the attacks, showing graphic scenes of dead children being pulled out from the rubble. By highlighting these grievances the hideous execution of allegedly coalition spies was justified. The death of children also used to encourage and glorify suicide attacks in retaliation. As this brief article showed, the concepts of life and death are utilized strategically to contribute to the military effort of IS. This article has briefly identified the ideological and doctrinal foundations of these concepts with reference to Qur'an and Prophetic traditions and the way they were interpreted and appropriated. The article has also shed light on how these concepts are portrayed in IS propaganda, using examples from video releases as well as religious songs. Understanding the ideological underpinnings of life and death and the way they appear in media may help in countering-terrorism efforts. Following this discussion, a number of points need to be considered while facing IS in the short and long term. In the short term, it is vital to limit the group’s ability to reach recruits online. It is undoubtedly true that radicalisation can happen offline; however, the availability of an uncontrolled online space remains key in motivating new recruits. As showed in the article, IS propaganda is used in a professional way to propagate specific ideas that suit the group’s military cause. Video messages are prepared in a way that appeal to potential recruits, using religious and doctrinal references in a misleading way. Stripping IS of its ability to propagate its message will be a huge blow to its outreach and this would limit its danger dramatically. On the other hand, there is a need to be prepared for a phase of increasing security challenges related to IS. The more territories IS loses in Syria and Iraq, the more dependent on suicide attacks it may become. As the article showed, for many of its supporters, the Islamic Caliphate is portrayed doctrinally as the only reason for living. Therefore, the collapse of the Caliphate may be a trigger for supporters to give up their lives to protect it and seek eternal afterlife. This may happen at the individual level as in the case of lone-wolves. However, IS may intentionally push its members to engage in suicide attacks to use them in its propaganda and to prove its existence and resilience. Finally, following this quick overview about the concepts of life and death and the way they are exploited by IS, and radical groups in general, it is essential to address the issue of religious reform with urgency. As we previously explained, religious convictions lie at the heart of processes of radicalisation and, thus, Muslim leaders should embark on a serious endeavour to restore the bright and positive view of this life and refute the notion that obtaining the eternal rewards requires abandoning the pleasures of this life. The sources of Islamic traditions are replete with remarks and stories that harmonise religious belief with enjoying the present life, an idea that needs to be further substantiated and spread. It is also significant to highlight the idea that life is precious and worth experiencing with all its social relations, family life, wealth, and joy. In conclusion, if such endeavours were coupled with an unshakeable disapproval and theological nullifying of any acts of terrorism committed in the name of Islam, this will certainly make it much more difficult for groups like IS to capitalise on death and mobilise young Muslims to carry out suicide attacks.